MAP: When they get out of prison, where do offenders go to live? In 2007, the Department of Corrections embarked on a transformation in the way it releases offenders to the community. Ordered by the State Legislature to stop “dumping” felons into Tacoma, Spokane, and other pockets of urbanity in the state, DOC was mandated to send prisoners back to their “county of origin” — the place of their first felony conviction. In 2012, about three out of every four inmates whose first felony was in Kitsap come back here after prison, according to DOC statistics. 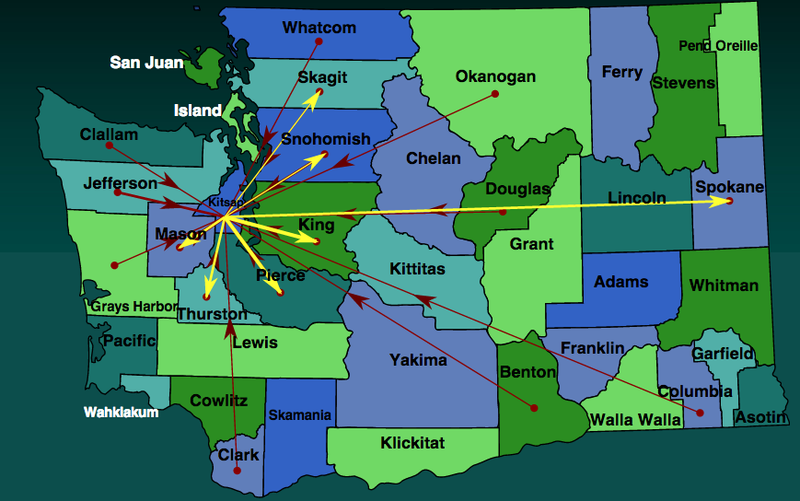 While they’re coming back to Kitsap, it appears they’re increasingly concentrated in Bremerton. But corrections officials say that clustering actually serves public safety best. To search and find out where every offender went home to in 2012 — and if they deviated from their county of origin — follow this link. The Tacoma News Tribune reported Sunday that some state lawmakers are hoping to move the state’s center for sexually violent predators off McNeil Island in South Puget Sound. The move could save the state some $6.6 million a year. The problem with moving it: would you want to live next door to such a place? The center, which the Kitsap Sun devoted a special report to in December 2010, was a bit cheaper to run when the state Department of Corrections ran a prison on the island, and could save money by having inmates work aboard the ferries and other core island tasks. But now that corrections is gone, the Special Commitment Center, home to nearly 300 people deemed sexually violent, is even more expensive. The SCC houses those who’ve done their prison time but have been determined by a jury to be too dangerous to release until they can be treated. I ask you, dear readers: Is it worth saving the money to move this facility? Anyone interested in how often felons return to prison after doing time should give a thorough reading to a report released last week by The Pew Center on the States. The results for Washington state aren’t particularly encouraging on their face: while 32.8 percent of offenders went back to prison between 1999 and 2002, 42.9 percent made a return behind bars between 2004 and 2007. However, it depends on how you read the numbers, corrections officials here say. Washington houses about 17,000 offenders in 12 prisons around the state. Seventy percent of inmates are in for a violent crime, according to the Department of Corrections. Corrections officials say the state would have a lower recidivism rate if we incarcerated more low-level felons, such as drug offenders. But the state has chosen to save money instead of locking them up. 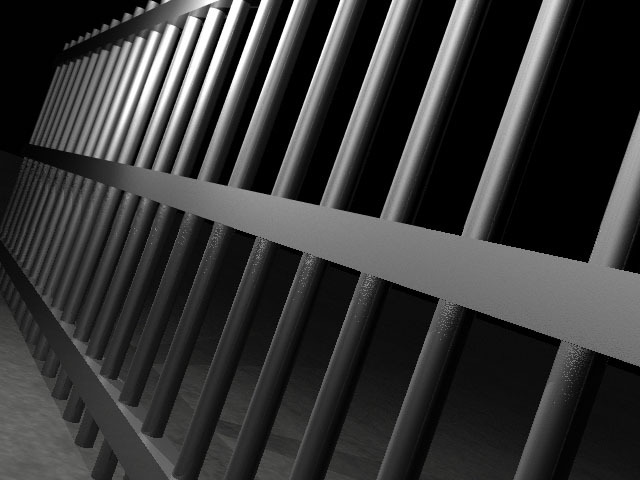 OLYMPIA — A study conducted by the Pew Center on the States found that fewer offenders in Washington return to prison after they complete their sentence. It also found that more Washington offenders who are supervised in the community are placed into custody when they violate the terms of their supervision. The study, titled “State of Recidivism: The Revolving Door of America’s Prisons,” found that between 1999 and 2004 the rate at which offenders in Washington return to prison for committing a new felony within three years declined from 27 percent to 23 percent. The Washington State Institute for Public Policy defines recidivism differently than Pew does, but both show the trend line for recidivism in Washington is on the decline. Washington ranks 42nd in the nation for incarceration, meaning it confines a relatively small number of people. 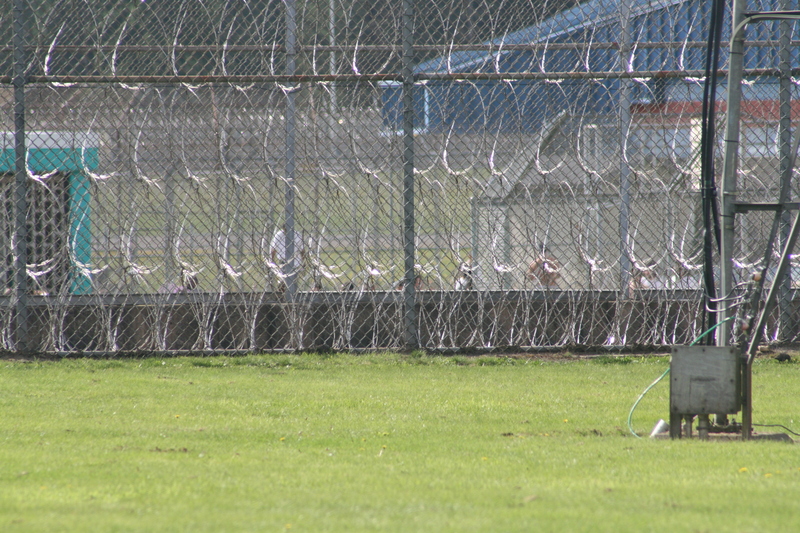 About 70 percent of offenders in Washington prisons are serving time for a violent crime. 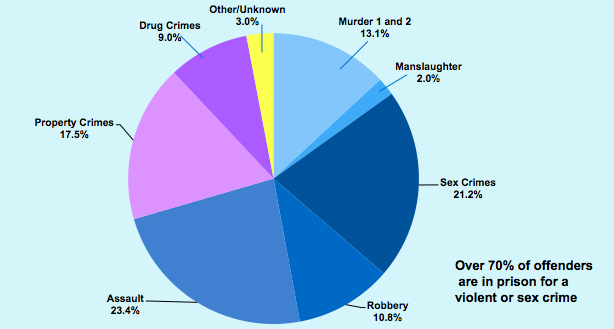 About half of the remaining 30 percent have previously been convicted of a violent crime. The Pew study notes a national trend of increased incarceration over the past 30 years, but Washington did not follow the national trend. Due in large part to sentencing alternatives for drug offenders and guidance from the state Sentencing Guideline Commission, Washington’s prison population did not increase at the same rate as most other states. Washington currently houses about 17,000 offenders in 12 prisons. The Washington State Institute for Public Policy has estimated that Washington’s prison population would be about 25,000 today had if it had kept up with the national incarceration trend. “The prison population in our state didn’t soar along with the rest of the nation because our lawmakers passed laws that made the public safer, not laws that only put more people in prison,” Vail said. Prisons Director Bernie Warner noted the recommendations in the Pew study – measuring and rewarding progress, beginning reentry efforts on an offender’s first day in prison and optimizing supervision resources – are actions that Washington has taken for years. Meanwhile, the percentage of offenders who are confined for violating the terms of their community supervision increased from 6 percent to 19 percent. That is due in large part to a state law that went into effect in 2000 that created a hearing process led by the Department of Corrections so that offenders would not have to go back through the courts when they are accused of violations. “The purpose of that law was to help us hold offenders more accountable for their actions while they are on are community supervision, and that’s exactly what happened,” said Anmarie Aylward, Assistant Secretary of the Community Corrections Division. 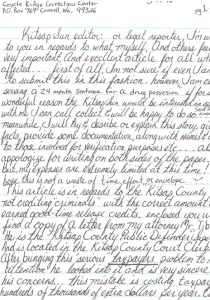 Mail from inmates at county jails and state and federal prisons is common in newsrooms, as those on the inside look to reporters to help with legal battles or civil rights violations. The same is true here at the Kitsap Sun. We review such mail — honestly, word for word — to see if there’s an injustice being done, however big or small. In many cases, the complaints don’t quite add up. In some, a quick phone call or email to the right person is all that’s needed. But sometimes, an inmate raises a concern that calls on us to tell a story. In May, I got such a letter. His name was Robert “Doug” Pierce, who you can read about in Sunday’s paper or online here. 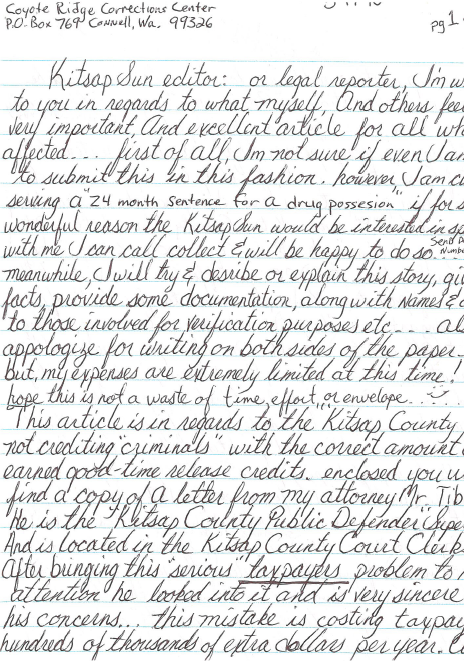 The Kitsap County jail had miscalculated his time off for good behavior — and he was right. “I just want it fixed so I can come home to my family after my debt is paid to society in full,” Pierce wrote in his letter. Pierce’s discovery was not only overlooked at the jail and lawyers in the system but at the Department of Corrections — and it set the stage for a change in policy at the Kitsap County jail. In doing the story, I wanted to examine all aspects of how good time is awarded. Thus, what you’ll find is an explanation of how it works at all levels — federal, state and each of the 39 county jails — and why it is administered in the first place. That included working with and submitting records requests to each of the state’s 37 jails. We also stumbled upon another interesting facet: that the state’s sunseting of a 50 percent off provision for good time went virtually unnoticed by anyone outside the system. For the results of our work, click here.